So, Lent has officially started. I'm not religious, but I like to give up something for Lent and it's usually alcohol. I'm also planning to forego Starbucks drinks for the 40 days of Lent too. Anybody else partaking, besides Chuck? When I was growing up, as Lutherans we rather ostentatiously avoided "giving up things for Lent." And avoided eating fish on Friday at any time of the year! Now, apparently, even some Lutherans think it's OK to go about with a smudge of dirt on your forehead on Ash Wednesday. When I was growing up, there was actual (very subtle) unfriendliness between a family of Lutheran neighbors next door and a family of Catholic neighbors behind us. My heathen family in between got along with both! I bet kids these days have never even heard of that kind of thing. I found the yogurt today in the store by my job! Very tasty.....It's like eating refrigerated raw red velvet batter. That may not sound very appetizng, but it's very tasty. LOL!!! LMAO!!! That's awesome Chuck!! I haven't seen this flavor in the store yet, but you can bet I'm looking for it! Well, I see that you found it Chuck! 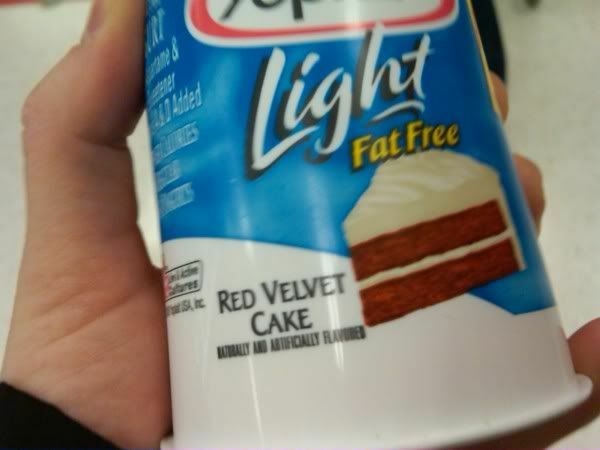 Actually, here the word "light" refers to no sugar, just aspartame and/or saccharine. So, no fat, no sugar--what's left? A little milk protein and.......glue? I dislike Yoplait Light because of the strong artificial sweetener taste. There's one with a kangaroo (can't think of the brand) that's pretty good, especially the maple flavor. Maple-flavored yogurt? Hmm. I don't even like that word, yogurt, but I might be tempted to try maple-flavored yogurt. It's pretty palatable! Many brands have maple flavor. Be sure to check that it's real maple, though.